Snorkel alongside an incredible 65,000 marine creatures on this Ultimate Snorkel experience at the Lost Chambers Aquarium in Dubai’s Atlantis The Palm. After an introductory briefing, don a supplied snorkel, mask and flotation vest, and enter the stunning Ambassador Lagoon. 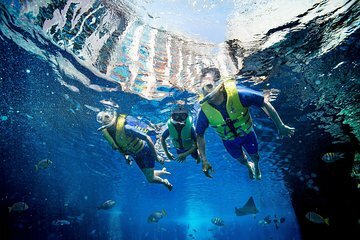 Then, float safely over the surface as you observe an awesome array of colorful aquatic life, from rays and shy reef sharks to huge, shimmying schools of exotic fish such as parrotfish and spotted snapper. Shorty wetsuits are also supplied for your snorkel. An ideal marine experience for families. Dubai offering another first for me... snorkelling! The staff who validated the tickets were a little miserable. However once I was escorted through to the top of the tank all that was a distant memory, not least of which because the snorkel instructors were far more friendly and really accommodating. After a short tutorial we got changed and were given a wet suit bring your own swimming gear, life jacket, snorkel and place to store our clothes, which is monitored by staff the entire time. The excitement built and I didn't need to be asked twice to get in. It was breathtaking in every sense of the word and after I regained my breath I was peering down at the most beguiling sight of all kinds of fish of all colours and sizes. You are free to swim on your own as long as you don't cross the area with the floatation balls halfway in the tank. The faux wreckage really gives the tank that Atlantis feel and you only come back to reality when passing one of the many viewing windows, accessible when booking the 'Lost Chambers Entry'. Time flew by and I exited the tank exhilarated and was given a bottle of water, towels, a shower and a private place to get changed. In short, an absolutely great experience. Fantastic location. However the experience itself was very limited. On the day of my arrival even though I phone thr company, nobody told me that there was some filming going on and as a result three quarters of the area acuarium was closed to all visitors. I must say that it was unacceptable. Should the people in Atlantis had mentioned, I could have had rearranged for another day. It left me disappointed . Everything was so organised, staff very helpful and snorkelling amazing - would highly recommend.